During the 2013 winter break, students from HSBC Business School once again participated in the Grameen Bank internship project in Bangladesh. The team mainly consisted of members from the Commercial Bank Association of Peking University, who was the main organizer of this project. Each year, the Commercial Bank Association organizes a number of students to participate in the Grameen Bank Winter Internship Program. The association is committed to taking full advantage of the international background of the HSBC Business School (PHBS) in order to build a professional networking platform and to inspire students interested in pursuing a career in commercial banking. This project also gives students a chance to experience banking that is more than for wealthy professionals and large commercial banks. “The project has been successfully carried out for two years. The Commercial Bank Association and the International Department of the Grameen Bank have established a good friendship and stable cooperative relations.” said Feng Cuiting, the president of the Commercial Bank Association. He continued to point out that the program provides opportunities for future PHBS students to take part in this internship. Li Fan, the vice president of the Commercial Bank Association, who was also in charge of the program this year, pointed out that the Commercial Bank Association internship project group contacted the International Department of the Grameen Bank in advance to get arrange their schedule, to arrange accommodation for students and to help participants with their visa application. The Commercial Bank Association tried their best to provide good services to the participants during the internship in Bangladesh, such as buying local phone cards for everyone. Participants visited the Grameen Bank Headquarters, conducted research on the specific operations of the bank in the local microcredit department of Grameen Bank and learned the effectiveness of the Bank and its impact on the local impoverished community. During the internship, students also experienced the lives of local people as well as the working operations of Grameen Bank. The internship project itself is a bold financial initiative. 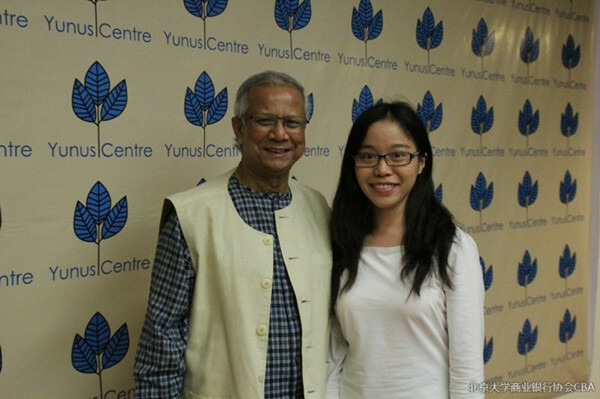 As Professor Yunus, founder of Grameen Bank, declared, "We celebrate the loans without collateral. We announced the end of an era of a long-term financial isolation. A loan is more than a business, like the food, the loan is a kind of human rights.” Loans based on trust give hope to the poor to improve their lives. This experience also gave the students of the Commercial Bank Association insights into the development of Chinese credit. In spite of the vastly different situations of Bangladesh and China, all countries can learn from the Grameen Bank to provide financial services for all of its citizens. Compared with its huge economic and social impact on Bangladesh and even the whole world, the actual method of microfinance services operations is simple. When a member takes a loan of 1000 taka, the effective interest rate is 10%, that is to say, the principal and interest of a total is 1100 taka with a repayment period of one year. The member’s weekly payment is 21 taka and at the same time he has to deposit 5 taka with a deposit interest rate of 8.5% to 12%. After a year, the member pays off the arrears and has a deposit of 260 taka. As long as the member successfully repays the loan, he will be able to borrow a greater amount. For example, with a loan of 2000 taka and a deposit of 10 taka every week, the member’s financial situation will be improved. Ultimately, he can get out of poverty. What’s more impressive is that the Grameen Bank has maintained a profit every year since its founding in 1983, except for the year of inception and 1991 and 1992 (when Bangladesh experienced serious flooding). During the internship, students had the opportunity to communicate with the local loan officers and borrowers directly. From the students’ immersion in the workings of the bank, they were able to form their own feelings about the people and the country. Zhang Yao, one of the participants, agrees with the training that members and borrowers of small loans have received. The entire microfinance services system is much more than just provision of loans to the poor. More importantly it is provision of loans with opportunity of full repayment. Of course, the entire system is also committed to improve the efficiency of financial services. The system allows bank branches to run directly in rural areas, so that the community can have more convenient access to financial services. Cao Tianjiao, another participant of this program, believes that the rural economy will be a new economic growth point. The Grameen Bank offers people a real opportunity to eliminate poverty; this causes its lender’s to respect of banking regulations and business ethics. Wang Yi, also one of the participants of this program, is very optimistic about the potential development prospects of the country. She points out that Grameen Bank is committed to the development of education and this in turn, can improve the potential for the development of the next generation and provides a bridge between the rich and poor. It will gradually promote Bangladesh to eliminate dependence on foreign financial aid. It is likely that the new generation can gradually form a common consensus that they should seize this opportunity to develop the economy. 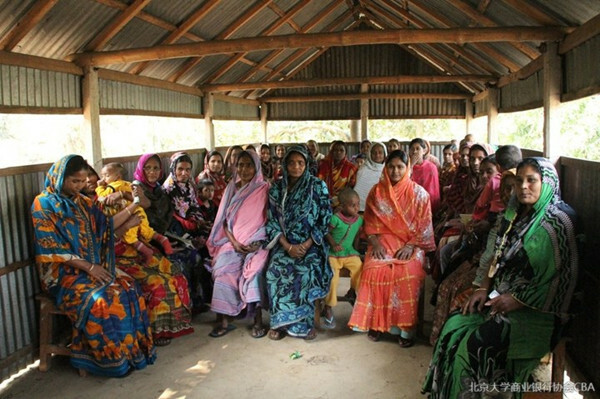 The promotion of economic and social progress in Bangladesh will only continue. However, it is undeniable that Bangladesh's economic development is far from complete due to the long-term existence of the strikes, hardships, lack of infrastructure and low education coverage. One major challenge is the high rate of local disease, the fragile healthcare system and the scarcity of medical facilities in Bangladesh. Local Zhang Yaogot suffered more stomach pains due to the local food and president of the Commercial Bank Association, Feng Cuiting, was infected with hada fever himself. 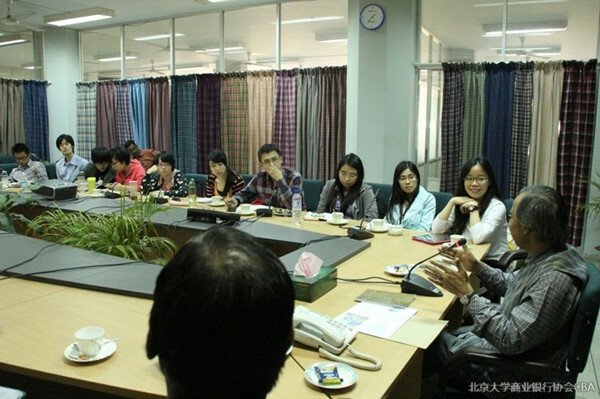 He shared his personal experiences with the internship students to give the students a better understanding of the realities of living in Bangladesh. After just two weeks, the internship came to an end. The Commercial Bank Association provided a unique opportunity for students to take part in an international internship. The participants themselves made efforts to offer locals with some assistance and further developed their own international perspective. 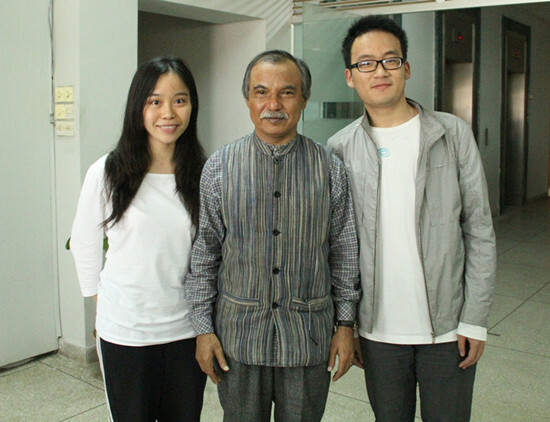 What they have brought back to China is not only their internship experience but also the spirit of helping the poor. Of course, there is still a long way to go. However, the HSBC Business School students are declaring that they are on the road to development.